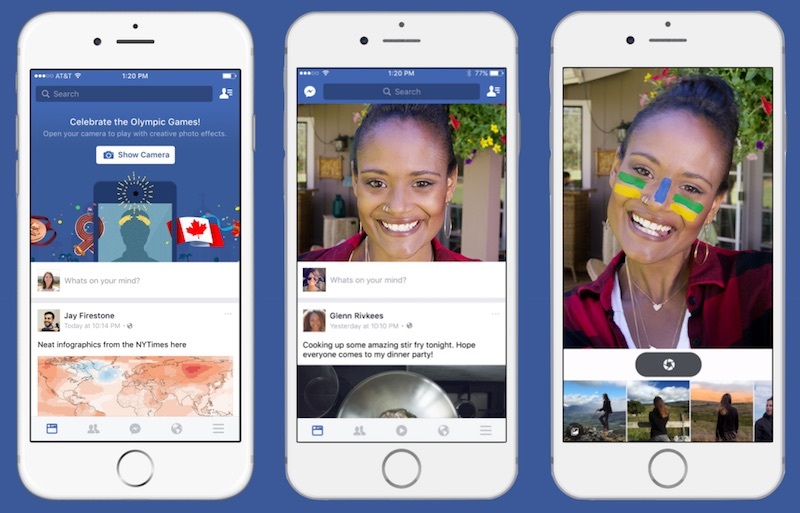 Facebook has started testing a new feature which will let users add filters, doodles, text, flags, and frames live. The update bears theme of the Summer Olympics Rio 2016 and has only been launched in Brazil and Canada as part of its Beta launch, but we can soon expect it to hit other countries as well. Facebook users in Canada and Brazil, who recently have updated their mobile application, would already be seeing an additional camera option. Through the new feature, users would see an open front facing camera and will be able to select through live filters by swiping on the screen. Users will be able to store the results either in the form of a picture or a Video and share among their followers in real-time. Facebook acquired Masquerade (MSQRD), a live filter iOS application, this year in March which gave Facebook capability over introducing live filters to its application, much similar to Snapchat. This experimentation appears to be a testing MSQRD capabilities incorporated with Facebook. The update is focused on creating a more visual social media environment instead of one with more written statuses. New features like 360 Gif, Live video, Instagram stories, and emojis have already been added. The post Facebook is testing Snapchat-like live video and image filters appeared first on TechJuice.